This week started with wet and cool weather having rain 5 out of the 7 days and temperatures stayed consistently in the low to mid 60’s with an exception of one day getting into the 70’s. We had a TV celebrity visitor this week as Babe & Kris Winkelman paid a visit to Fireside Lodge of which more will be heard of in the near future. See Picture below. 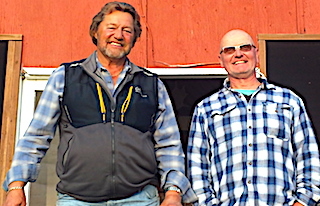 Bob & Ollie Waldeck from Cotter, AR returned for their 6th consecutive year reconnecting with very good friend Rich Santos from Pasco, WA for his 4th consecutive year. 1st day was a terrific start catching exactly 50 Smallmouth Bass & Bob had a BIG Muskie on bass tackle but lost the battle. 2nd day was good bass fishing and Bob again hooked a nice 33-inch Pike on a Ned Rig and managed to land it on 8lb test with no leader. 3rd day had they catching 39 Smallmouth Bass with Ollie having a bang up day landing 2-18.5-inch and 1-19.25-inch Trophy Smallmouth Bass. 4th day was spent catching mostly Pike with a few Smallmouth Bass mixed in. 5th day these three had fun exploring new waters and increasing their knowledge of our lake system. 6th and final day they did great catching a lot of Smallmouth Bass with Rich also catching a good number of his Fly-Fishing. Rich was sad to leave and parted saying he hopes to return next year. Rich made great memories with very close friends, Ollie & Bob, who will be spending another week with us. Rick Leever from Lornville, AZ with fishing buddy Steve Brockman from Saint Mary’s, GA were back for their 2nd consecutive year. 1st day had Rich catching mostly Pike and Steve got into some Smallmouth Bass after they found some emerging mayflies & Steve just threw into them getting some good action. 2nd day was a great day catching Northern Pike using the simple set up, a twister tail grub, as they caught over 150 Northern Pike. They were actually tired of catching Pike by the end of the day. 3rd and 4th days were spent targeting Smallmouth Bass and catching some Northern Pike. In the Smallmouth category they caught some nice fish up to 17.5-inches. 5th day had them again catching many Northern Pike plus Steve got into some Smallmouth Bass up to 17.5-inches. 6th and final day was very windy limiting their locations to fish & fishing presentations but still caught a mix of Smallmouth & Pike. Great trip between two fishing buddies. First time Group from TN were Billy Douglas, West Newman, Chris Heppel, from Memphis, Joel & Jay Fulmer from Nashville, and Mark Whitaker from Cordova. 1st day had Billy & Chris catching over 50 Smallmouth with the other two boats catching 20 to 25 per boat. 2nd day had Billy & Chris catching 59 Smallmouth Chris landing a trophy at 19-inches and Billy landed a 20-inch Monster. West & Mark had a 20 Smallmouth day & Joel & Jay caught about 70. Another milestone was Chris catching his 1st ever Muskie. 3rd day was another good day fishing with the high total going to West & Mark catching over 70 Smallmouth Bass, Billy & Chris were just over 50 with several Pike, & Joel & Jay had over 30 and some Pike. Lot of the Smallmouth and Pike were caught on Blue Fox Spinners so that evening I had a run on the #5’s from this group. 4th day they caught Smallmouth Bass at the tune of 20 to 40 per boat & a good number of Pike using the Blue Fox Spinner. 5th and final day the had another great day catching Smallmouth Bass on the Ned Rig being their go to bait this trip. All left saying they had a terrific stay and intend on returning in 2018. Jack Black from Norris, TN with son Mike & grandson Jesse were with us for their 1st visit. First day they caught both Smallmouth Bass & Northern Pike and Mike had a huge 15 to 20lb Muskie roll on his lure right at the boat. 2nd day Mike said that they found them catching Northern Pike mostly by using trolling methods with diving hard baits in either silver blue or firetiger colors. The highlight fish were two very large upper 30-inch Northern Pike and Jesse hooked and landed his very first Muskie at 33-inches. 3rd day they discover some new areas catching some nice Pike and Jesse continued to have success on a particular lure in the Firetiger color which got mangled beyond use so all three bought similar lures from my tackle shop. The next day they put them to good use catching Northern Pike & Jesse caught his 2nd Muskie. 5th and final day, after a map discussion they fished several areas new to them with one working out particularly well landing many Northern Pike, trolling the lures they purchased, through a narrows with current. All left having a wonderful and very memorable 3 generations fishing trip. John Murphy (Dad / Grandfather) from Bloomfield, MI son Brian with his sons Quinn & Jack from Darien, CT returned to Fireside Lodge for their 5th consecutive year. 1st day out was great catching some Smallmouth Bass on sinking worms then hitting a great Northern Pike area catching 75. 2nd day was even better as this family teamed up to catch over 100 Northern Pike. Third day, because of flight times, they only had a half day which they spent catching Smallmouth Bass and several Northern Pike. This concluded another traditional family fishing trip full of memories, originating when Brian was a young boy. They departed leaving some equipment with all intentions of returning in 2018. Cousins Frank Kerr from Plainfield, IN & Doug Kerr from Henrico, NC returned for the 7th consecutive year with Greg Stowe also from Henrico for his 2nd. 1st day they did very well catching 36 Smallmouth Bass. 2nd day was fishing post mayfly hatch still managing to catch 20 good fish. 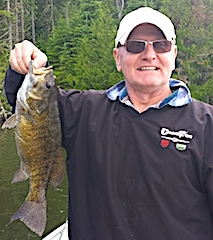 3rd day was much better catching 38 Smallmouth Bass with Doug being the BIG fish master for the day. 4th day was another good Smallmouth Bass day catching a total of 33. 5th day was a super Pike fishing day as they caught 65 Northern Pike having lots of action and fun. 6th and final day wasn’t their best but after such a great week fishing they were very satisfied all really enjoying the laughs and conversation among two cousins and a very good friend. Upon departure Doug mentioned he would be calling within a few days to arrange their dates for 2018. Long time return guest, since our 1st year in 1990, Kevin & Brenda Kubiak from Willoughby, OH were thrilled to be back. 1st day was a trip into Cedarbough. They had a wonderful day catching some fish and enjoying the day. 2nd day was a great day catching many Northern Pike plus Kevin caught a few large Smallmouth Bass. 3rd day had them catching 25 Smallmouth Bass. 4th day they caught numbers of Northern Pike. No monsters but loads of fun, plus Kevin caught 3 nice Smallmouth Bass. 5th day was very active with Northern Pike and they caught a few Smallmouth Bass with Brenda coming up with a BIG 18.5-inch Trophy Smallmouth. 6th & final day was a great day Smallmouth Bass fishing with all being 15 to 16.5-inches. Both said they had a terrific visit and before departing made their reservation for 2018. Referred to us by a good friend the Kashin family of Aaron, Brian, Ron, Toronto, ON & Andrew New York, NY were here for their first Fireside Lodge fishing experience. They got started the first day catching a mix of Smallmouth Bass and Northern Pike plus Brian caught a 20-inch Walleye. The 2nd day of their quick 2.5 days they ventured further down the lake catching Smallmouth Bass using leeches and lures plus few Northern Pike. During there last half day before having to catch their mid afternoon flight, they made the most of their time catching fish and making family memories between 3 generations. 20-year guests Al Fishhaber and fishing buddy Rob Delamatre from Northfield & Sandusky, OH were back to chase the BIG Toothy Critters. DOA within minutes of getting on the water Rob caught a nice Muskie. 2nd day had them catching a lot of Northern Pike before supper and afterwards they caught 6 more Pike and Al caught Muskie & Tiger Muskie back to back, both being in the mid to high 30-inch range. Third day they caught Northern Pike in numbers by noon & Al landed a HUGE 19-inch Smallmouth Bass. Then they searched for the BIG Dogs catching some fish in the mid 30” range and seeing some enormous Pike & Muskie follows. By the end of the day they landed 10 Muskie total since day one. 5th day the caught endless Pike until noon, Rob catching 25 fly fishing on 1 fly with multiple misses. Then they searched for bigger fish catching 12 larger Pike including their 12th Muskie of the trip. 6th day was a half-day fishing, as they got on the road at 5:00pm finishing with some very nice size Northern Pike. Upon departing Al talked about bringing his grandson next year. grandson Cole from Forth Worth, TX for his 4th trip. 1st day was a slightly tougher day getting the fish to hit a lure as they got a lot of follows. They did catch several Pike and Smallmouth Bass plus Lloyd caught the largest fish of the day landing a 34-inch Pike. 2nd day Lloyd said they caught as many Northern Pike as they wanted to all day long. 3rd day was searching for bigger toothy critters seeing plenty of follows but only getting a few to hit. They did catch some other smaller Pike and a few very nice Smallmouth Bass, Cole coming up with a 19”er. 4th day had them catching a good amount of Pike and getting an amazing amount of follows. 5th day they caught Northern Pike all day long and Lloyd again said they caught as many as they wanted to catch. 6th day they did great catching well over 20 Smallmouth Bass, Cole catching the majority of them on a Ned Rig and Tiny Torpedo. 7th and final day was a very good day Smallmouth Bass fishing putting a very nice finish to a great fishing trip making memories between Grandfather & Grandson. As Lloyd was saying goodbye to his newfound Fireside Friends Ollie & Bob (above) he said see you next year. Long time guests Jim McCollam son Ryan, Jim Havlin son Jim Jr, Ron Tucker son Shane brought newcomers Eddie, Dan Dugdale, Dan Carie, and Phil Cuddy. From Orland Park, Orland Hills, and New Lennox, IL. 1st day was a super Northern Pike day with Jim & Ryan catching the most at over 80 Northern Pike themselves and well over 150 for the group. Second day was a mixed bag of this group catching Smallmouth Bass and Northern Pike with some boats doing well on Numbers and others on size fish. Phil who has never been on a fishing trip like this before had a great day and Ron Tucker while fishing with his son Shane caught his biggest ever Muskie measuring a BIG FAT 38-inches. Next day the reports were also very good as Jimmy & son Jim did well Smallmouth fishing and Dan Dugdale said he had the best fishing day of his life landing a 37 and 38-inch Northern Pike. 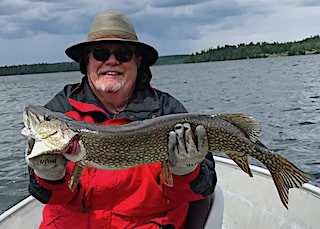 Eddie had an encounter of the 3rd kind with a Giant mid-45-inch plus Northern Pike roll on his lure. 4th and final day Dan Carie and Phil teamed up for over 20 Northern Pike while Jim & Ryan caught well over 60 and for the second day the group caught about 150 Northern Pike. All had a blast as you can hear their laughter in the dinning room and at the dock every day and the chatter before departing was about a return trip. Mike, Susie, and Andy Pritzl from Caledonia, WI, guests since 2003, were back to fish and enjoy our wonderful atmosphere and wilderness surroundings. 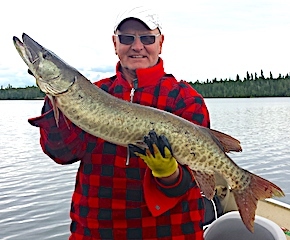 1st of their 3 days was fabulous Muskie fishing getting follows and landing 4 Muskie with Mike getting the top billing catching a very nice 38.5-inch heavy fish being his personal best Muskie. 2nd day was all about Northern Pike and they had absolutely terrific action ending up catching 67 total for the day. 3rd and final day (boy 3 days goes fast) they targeted Smallmouth Bass and had a more challenging day. The Mayflies were in full hatch and had plenty to eat so they ended up catching some but not what they have done in the past. Susie, not being a fisher, enjoyed the atmosphere and wilderness setting we have to offer at Fireside Lodge and all went home making some wonderful family memories.